Some people get "page you requested was not found"
I am currently running a number of contest giveaways using Jotform. I love your product, but every now adn then we get someone who says they click the link we provide to the iframe Facebook for the jotform, and get "the page you requested was not found". Now I checked on all the other browsers I use, internet explorer, chrome and firefox and I receive no such image. I then checked on my iPhone Facebook app and when I clicekd the link I received the image. Is it just because the mobile device isnt capable of allowing such sites? Please let me know so I can properly address the customer. I'm currently not able to replicate this problem. How long ago was it that this previously happened? And did you check your submissions to see if it came through or not? It seems that the problem is stemming from those people who are tring to acccess the Form on Facebook--through their mobile Facebook application...not sure why it is just that, and that alone though. Sort of odd. I think this should be addressed to Facebook. Here's a similar case which was reported to Facebook Developers: http://developers.facebook.com/bugs/480898328602564/, there are actually more when you search it in google. Unfortunately we can't do something about it since the issue occurs on their end. The issue is still there. How come facebook takes so long not to fix this? @huey, as mentioned by Elton above this issue is occurring on Facebook's side and unfortunately we can't do something about it. 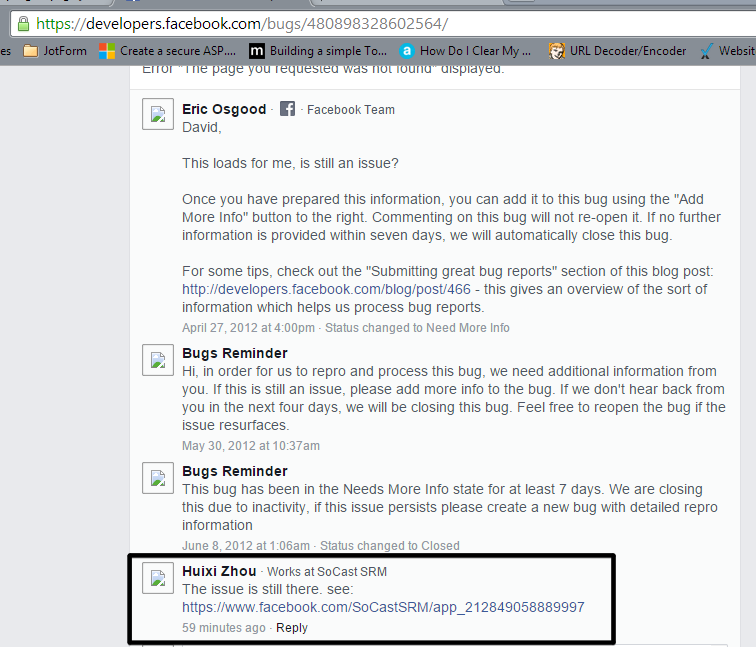 I saw that they closed the bug report due to inactivity, but someone replied to it. I hope that they reopen the bug report and come up with a fix soon.